Baekhee Lee (IME Ph.D. candidate) and Jihyoung Lee (IME M.S. candidate) of the Ergonomic Design Technology Lab (advisor Professor Heecheon You) invented the “PC based glaucoma detector,” which can be easily installed on a PC to test one’s sight and development of glaucoma. 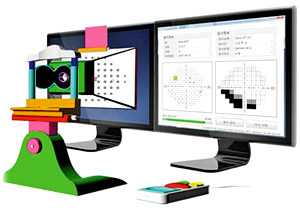 The detachable, newly developed equipment effectively induces eye movements and allows for a self-vision test. The result is further used to analyze the progress of optic nerve damage, therefore the diagnosis of glaucoma. Glaucoma is an eye disorder in which the optic nerve is damaged, permanently impairing vision and progressing to complete blindness if untreated. For this reason, diagnosis at an early stage is crucial. Until now, the diagnosis could only be done at large hospitals because the equipment was too costly and large in size. This system also received the grand prize at the 2011 University Creative Invention Contest.